Computational modeling is an important tool for understanding and improving food processing and manufacturing. It is used for many different purposes, including process design and process optimization. However, modeling goes beyond the process and can include applications to understand and optimize food storage and the food supply chain, and to perform a life cycle analysis. 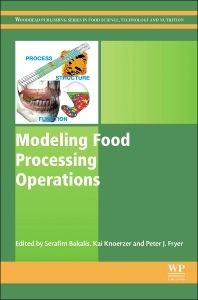 Modeling Food Processing Operations provides a comprehensive overview of the various applications of modeling in conventional food processing. The needs of industry, current practices, and state-of-the-art technologies are examined, and case studies are provided. Part One provides an introduction to the topic, with a particular focus on modeling and simulation strategies in food processing operations. Part Two reviews the modeling of various food processes involving heating and cooling. These processes include: thermal inactivation; sterilization and pasteurization; drying; baking; frying; and chilled and frozen food processing, storage and display. Part Three examines the modeling of multiphase unit operations such as membrane separation, extrusion processes and food digestion, and reviews models used to optimize food distribution. Food engineers, research and development managers in food processing and manufacturing, and academics and postgraduate students with a research interest in this area. Professor Peter Fryer is a Professor of Chemical Engineering at the University of Birmingham, UK.